The BCFM Committee would like to thank Allure by the Bay for their support in the production of the BCFM Cook Book. With Christmas just around the corner, it’s the perfect time to pop into Allure and finish off your Christmas shopping – plus, you’ll be supporting a wonderful local business! Located in Rosny, Allure by the Bay carry a range of wardrobe essentials that never date and with a wide range of labels, styles and sizes, it’s not unusual to find something for mum and something for daughter. At Allure, staff are there to help you find the right outfit that suits you and makes you feel comfortable and special. There is also an extensive range of accessories to finish off your outfit in style: handbags, wallets, jewellery, belts, scarves, gloves and hatinators – anything and everything! 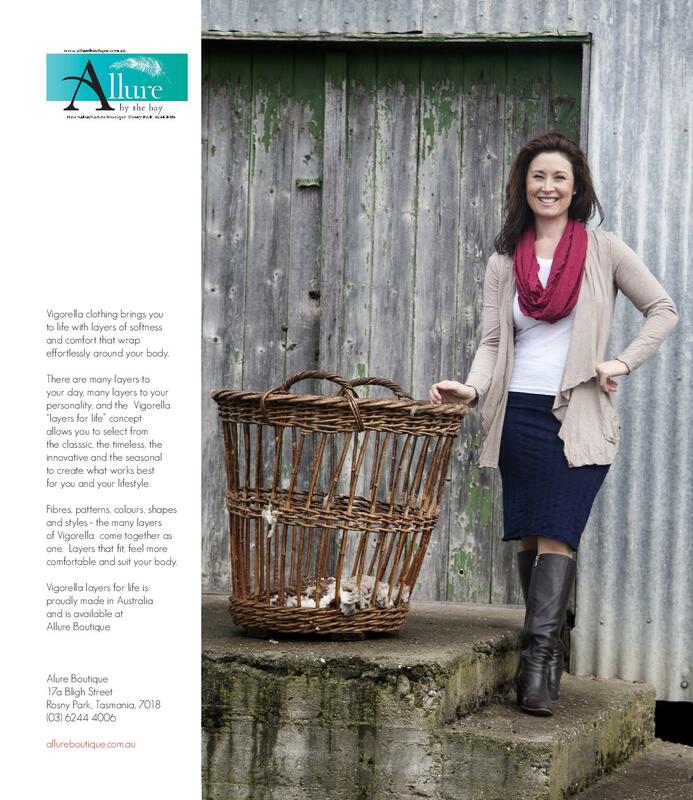 Allure also stock the lovely Vigorella range, which is proudly made in Australia. At Allure by the Bay – it’s all about you! Read on for a fabulous recipe by Eloise Emmett and Susan Daly for a simple and delicious salad which is perfect for this time of year – quick and easy to assemble for lunch or a light supper. For more great recipes, be sure to get your copy of the Bream Creek Farmers Market Cook Book. Scrub the potatoes and put them in a medium sized saucepan, cover with water and bring to the boil. Simmer for 15 minutes until the potatoes are cooked but firm. Drain the potatoes. When cool, cut into 1cm cubes. To hard boil the eggs, bring a small saucepan of water to the boil, add the eggs and cook for 10 minutes. Cool, peel and cut into quarters. Combine the sour cream and mayonnaise in a small bowl. To assemble, arrange the potatoes, egg and salmon on a platter. Drizzle with the sour cream dressing, sprinkle with the finely sliced onion, capers and chopped herbs. Season with salt and pepper to taste and serve. For an easy and impressive dinner party dish, this salad could be served with a baked salmon steak (omitting the smoked salmon from the salad). Alternatively, substitute tinned Australian salmon for an easy picnic dish or lovely lunchbox treat. The distinctive flavour of Tasmanian Pink Eye potatoes cannot be beaten. New season Pink Eyes are available in Tasmanian over the summer months. If Pink Eye potatoes are not available, try other Daly Potato varieties such as Red Rascal or Purple Gem. Dill is a hardy annual and both the leaves and seeds may be used in cooking. Dill grows easily from seed – but when you are planting, ensure your plants will have plenty of room to spread. If you sow just a few seeds and let the plants themselves go to seed, you will never have to worry about planting more! « Cook Book Launch a Roaring Success!